The best cure is a nice drive. Gonna find some canyons and cruise. Where are you all driving today? 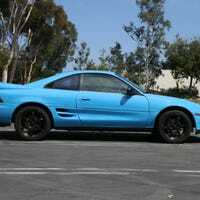 Making a YouTube Channel for my MR2. Suggest adventures! Have you ever wondered what it’s like to daily an autocross-prepped MR2? I’m making a channel for my adventures with WAY2BLU, and I’d like OPPO’s suggestions for videos! How does one affix a mudflap to a fender like this? Bought universal-fit mudflaps, but 3 of 4 of my fenders don’t have liners. Oppo, how would you go about installing mudflaps? Ever wonder what a stock MR2 sounds like on a dyno? Not much sound at all, apparently. Got my Toyota locally smogged today; apologies to His Stigness; I will try to bring my other car once it’s due for a check. I’ve had the MR2 almost 2 years, what do y’all wanna know about it? I’ll post a big review this week, but what’s Oppo wanna know about the WAY2BLU experience? A crazy idea has occurred to me, but I need Oppo’s advice. After autocross this weekend, I’ve noticed my MR2’s steering wheel shakes rather violently at any speed above ~55 mph. Seems like a front suspension issue. Any Oppos know what it could be? Who else is crossing auto this weekend?